The Crocodile Bridge on the Tarcoles River is a strange place. Cars stopped at the bridge itself, people walking – not just along the narrow sidewalks, but across the lanes… Abelardo Benavides, our guide, explained that there are up to a hundred American Crocodiles along one kilometre of the river underneath us. Yet, as a team participating in a bird race, we had our schedule, to appear at the lodge at 6.30 pm. And since crocs sport no feathers, we went to check the Tarcoles town beach instead. That was my first ever beach on the Pacific Ocean (Costa Rica offered me so many easy ways out of that molesting question that I sometimes ask myself: When was the last time I did something for the first time?). Kids in school uniforms, colourful houses among coconut palms, the American Black Vulture sitting in the closer one, observing us – we must be appearing exhausted. Not many birds, two Ruddy Turnstones, one Willet, a fishing boat in front of the beach with a small flock of Brown Pelicans surrounding it, several Magnificent Frigatebirds above it… and several smaller flocks of noisy Scarlet Macaws above us. 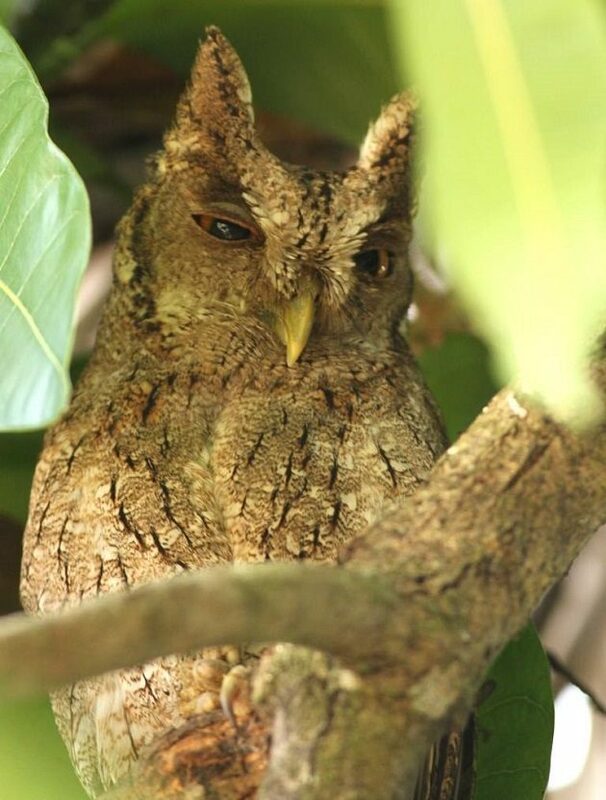 Quite unbelievable birds, they look more like some Hollywood prop than real wild organisms. 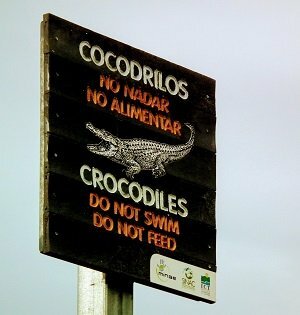 The strangest thing on this beach was the sign “Crocodiles – do not swim, do not feed [them]”. I mean, I am in Central America, not northern Australia?!? These American Crocodiles are utilizing river estuaries and the ocean shallows represent their corridor from one estuary to another. Anyway, I had no plans of swimming. Off to the Macaw Lodge, over the hills skirting the Carara National Park. This park protects the primary rainforest of the Tarcoles River basin, together with the one of the three remaining populations of Scarlet Macaws in the country. 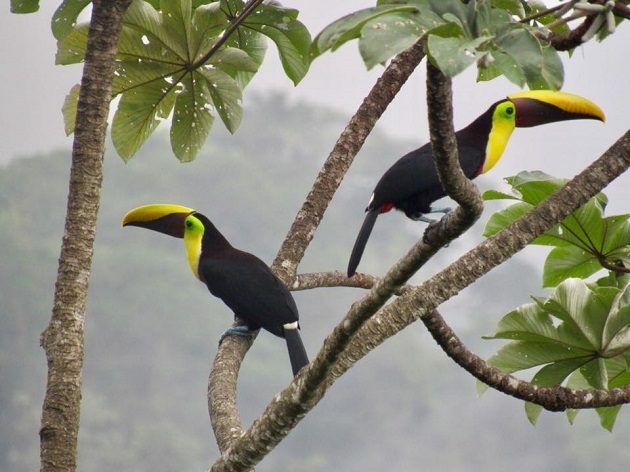 Beside macaws, Carara eBird hotspot has a bird list of 424 species. 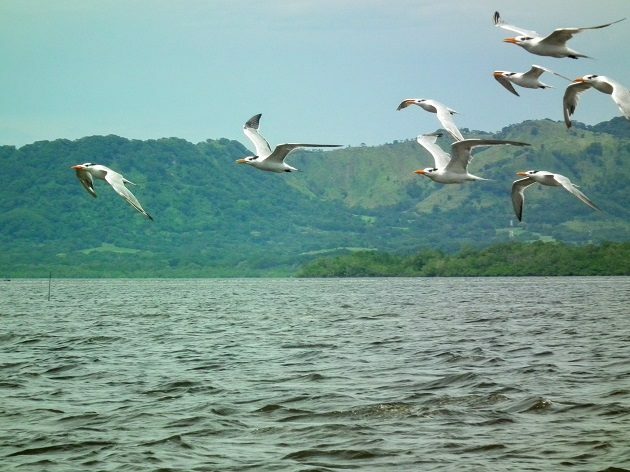 The park lies at the meeting point of two biomes, the savanna-like dry Northwest lowlands and the humid rainforest of the Southern Pacific lowlands, offering species of both dry and humid habitats, which makes it a must for any visiting birder. 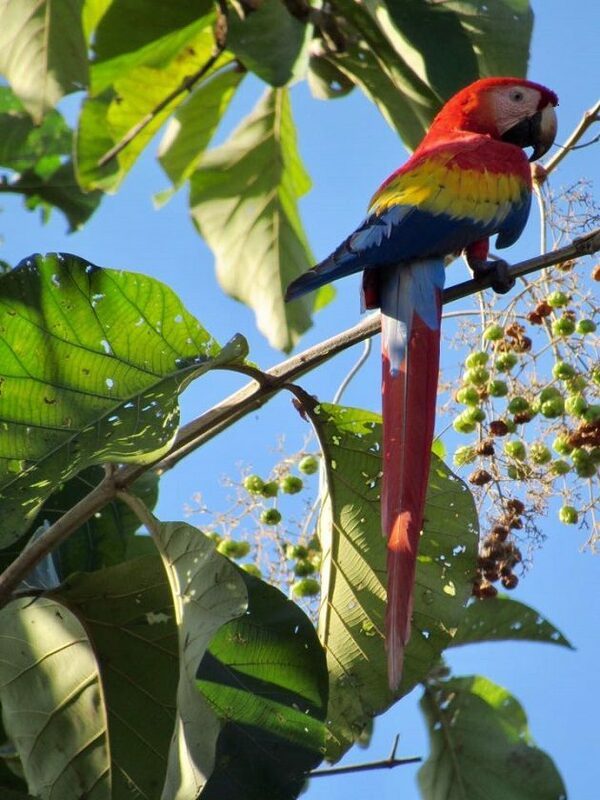 Judging by the distribution map at BirdLife’s website, Scarlet Macaws should inhabit the entire Pacific side of Costa Rica, but the range map in the local field guide (The Birds of Costa Rica, by Garriguez and Dean) says that they inhabit only three widely separated spots along the Pacific coast. The good news is, they are spreading further naturally, but their remaining habitats are cut off by plantations of bananas, pineapples, etc. Hence, a project of planting indigenous trees along the coast should help them to interconnect those tree spots on the map. The dirt road went up and down the Turrubares hills, past one White-nosed Coati showing well in the open, and a White-whiskered Puffbird and two Crested Guans. Some sections were somewhat bumpy and when we reached the lodge after an hour long drive, it was already dark. The Macaw Lodge can be summed up in just one word – tranquility. Settled deep in the primary rainforest adjacent to the Carara park, it is an unusual octagonal two-story wooden building with many walls missing, allowing for the air flow, both horizontally, from the entrance to the veranda with the dining area at the opposite side, and vertically, through the central spiral stairs area and semi-open roof. Add to that that rooms have no outer walls, but the mosquito netting instead, from one side-wall to another (not that there were any mosquitoes). 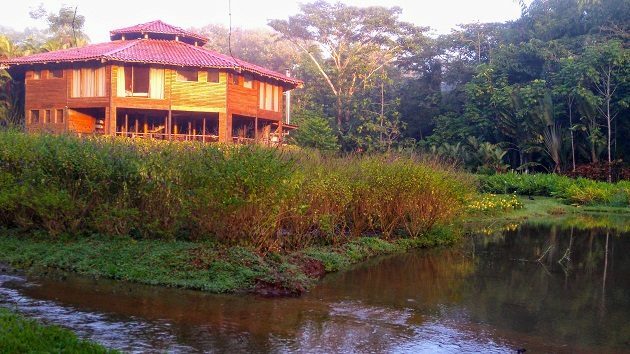 The lodge treats its wastewaters, produces its own electricity from sun, and on its own farm grow cocoa, using it in for ice cream and making its own chocolate. 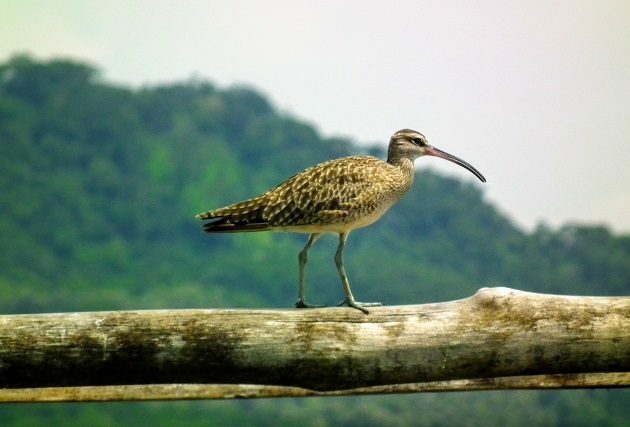 Several kilometres of walking trails offer 310 bird species, as listed at the Macaw Lodge eBird hotspot, including Sunbittern, Amazon Kingfisher and the Great Tinamou. 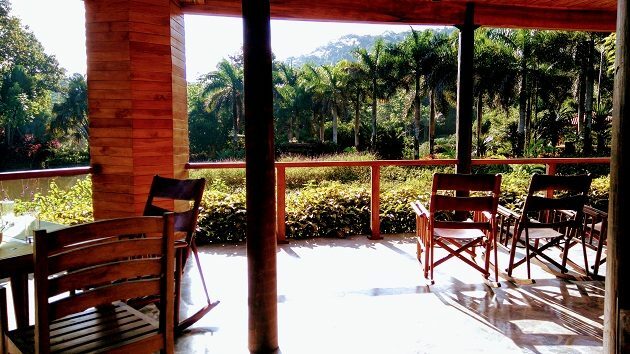 I managed to make one very stupid step, outstretching my ligaments and getting a swollen knee, so, instead of exploring the Carara trails, spent the next day in a rocking chair at the lodge veranda. And I didn’t felt sorry at all – birding from the veranda offered newly split Gray-cowled Wood-Rail, endemic Charming Hummingbird, Ringed Kingfisher, Yellow-throated (Black-mandibled) Toucan (cover photo by Ed Hutchings), endemic Golden-naped Woodpeckers and Cherrie’s Tanagers, etc. When the short-lived downpour started, the harsh raaak, raaak broke the sedative sound of raindrops on the water and a 50-strong flock of Scarlet Macaws appeared in the mahogany tree tops. I was the only guest staying during the mid-day, but as soon as the first raucous raaak was heard, the entire kitchen staff hurried to the veranda to admire the macaws. Those birds came there every day, those people work there and see them every day and yet, the coming of the flock is such an attraction that they become school kids startled by big scarlet birds again and again. They smiled at me, I smiled back. Being a birder who travelled 11,000 km / 7,000 mi to admire those same birds, I perfectly understand them. La Ensenada Lodge in the Gulf of Nicoya was our next destination: the saltpans – shorebirds including two apparently locally rare Dunlins; rather lush dry forest, due to the recent tropical storm – Ferruginous Pygmy-Owl, Black-headed and Gartered Trogons, Hoffmann’s Woodpecker, White-collared Seedeater; lunch at the lodge with two Pacific Screech-Owls above the entrance and their boat tour of the mangroves at the Rio Abangares Delta. 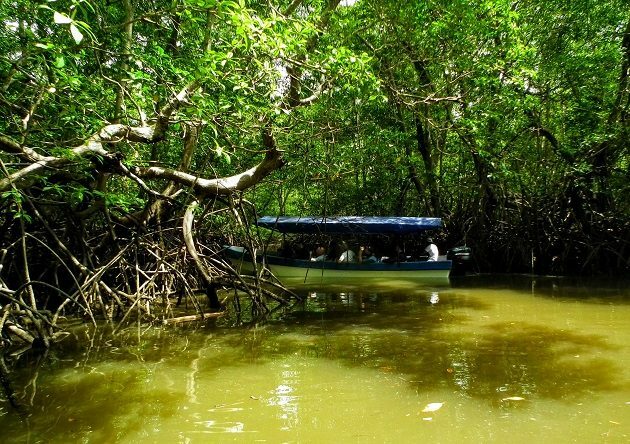 Since I started to bird by kayak, mangroves were something I long dreamed about. Only, this time I had no paddle and no control over our speed or course. Brown Pelicans and Royal Terns abound. We were in two boats with strong outboard engines whose skippers were racing each other to reach the delta. Sitting in the front meant a genuine rodeo of a ride, holding my camera with one hand and holding for the seat for dear life with the other (in such situations, it comes handy to be able to speak the language nobody else in the boat understands). 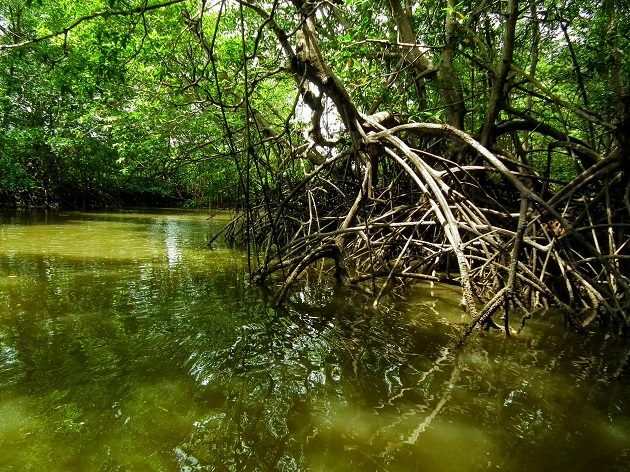 Once among the soothing myriad of waterways edged by protruding roots of mangroves, Tricoloured and Green Herons, Whimbrels and Willets were everywhere, together with Ringed and Belted Kingfisher or two… If you are asking yourself, no, there weren’t any mosquitoes. For me the definite stars of the tour were a great many Ospreys. We saw half a dozen – at least, more likely a dozen, but I cannot be certain which birds made a second appearance. Whatever the case, I have never seen so many of them before. I’ve wanted to go to Costa Rica for so long. Thanks for this inspiring post!